Cut chicken breasts in half (so you have 4 total pieces). Pound each breast to a 1/2-inch thickness. Heat grill to medium. When grill is ready, coat grates lightly with olive oil. Cook chicken on grill, keeping grill open and turning chicken every few minutes, 10 to 15 minutes total, or until cooked through. Meanwhile, in a small saucepan over medium-high heat, bring balsamic vinegar to a boil then reduce heat to low. Simmer vinegar until reduced by half and syrupy. Remove from heat. Transfer chicken to a serving plate. Top each piece immediately with a slice of mozzarella cheese, a fresh basil leaf and a slice of tomato. Drizzle balsamic reduction on top before serving. We've got easy caprese...and it's on your grilled chicken dinner! Raise your hand if you love grilled chicken. Now raise your other hand if you love grilled chicken with melty mozzarella cheese, tomato, basil and balsamic vinegar on top. Now do the double dream hands! Just kidding. But in all truth, I’m feeling ready for a victory dance thanks to this Grilled Caprese Chicken recipe inspired by Add a Pinch because it’s so flippin’ easy to make and so flippin’ delicious to eat. And that’s a flippin’ winner winner chicken dinner, if you ask me. But enough of my yammering – let’s grill some chicken! Here is just about everything you’ll need to make the magic happen in this recipe. 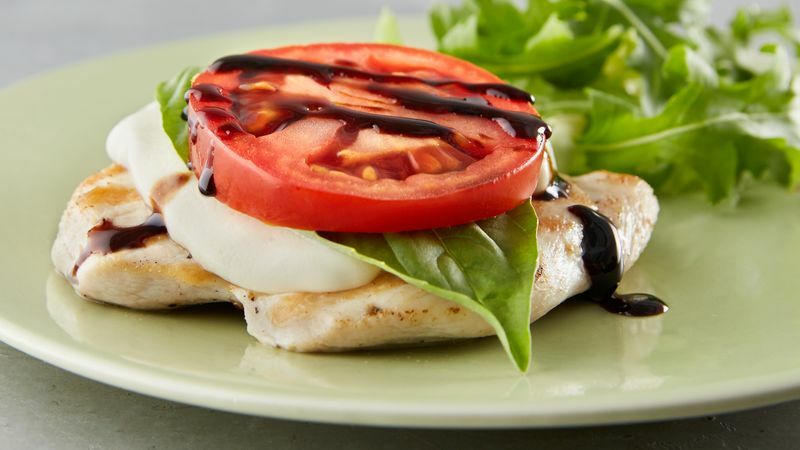 We’ve got fresh mozzarella, a tomato, fresh basil leaves, balsamic vinegar and chicken. Mmmmhmmm. Heat your grill to medium and place the chicken on lightly greased grates. I cut my chicken breasts in half and pounded them to 1/2-inch thickness so they cook more uniformly. Meanwhile, cook the balsamic vinegar on the stovetop until reduced by half and syrupy. Do everything in your power not to drink it before you use it. Resist! Top the chicken with fresh mozzarella slices, fresh basil leaves, tomato aaaaaaaaand the balsamic reduction. Oh, the caprese-ness. Oh, the tastiness. Oh, the omnomnomnomnom. Oh, are you still here? Sorry, I’m already on my second helping. Stephanie (aka Girl Versus Dough) highly suggests you make this recipe soon. Like right now. Chop chop. Check out Stephanie’s Tablespoon member profile and keep checking back for her own personal recipes on Tablespoon!